279 pages | 6 B/W Illus. Republican China attracted an uncommon diversity of foreign interests, groups, and individuals, which included missionaries, adventurers, diplomats, academics, humanitarians and refugees, as well as hedonists and tourists. 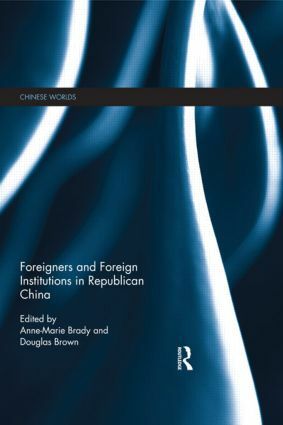 By exploring the diverse nature of foreign activities in Republican China, this book complicates the dominant narratives of the imperialistic foreigner and Chinese victim, and moves beyond the depiction of foreigners as privileged and the Chinese as simply weak. The spaces and relationships examined in the essays in this volume reveal a complex series of interactions between foreigners and the people of China which go far beyond one-way transmission or exploitation. Indeed, this book examines how diverse and sometimes seemingly peripheral foreign individuals and communities influenced literature, education, trade, sexual morality, warfare, and architecture in China and in the process were themselves profoundly changed, in ways that are as remarkable as those experienced by the Chinese they had come to observe, meet, exploit, conquer, assist, or change. Bringing together the work of a diverse group of scholars on Republican China, this edited volume adopts a uniquely multi-disciplinary approach to the study of foreigners in China, and utilises the perspectives of historiography, literary studies, cultural studies, sociology, anthropology, and political science. As such, this interesting and innovative book will be of great interest to students and scholars from diverse fields including Chinese and global history, politics and international relations, Chinese studies, literary studies and gender studies. Anne-Marie Brady is an Associate Professor in Political Science at the University of Canterbury in Christchurch, New Zealand. Douglas Brown teaches in the English department of John Abbott College in Ste.-Anne-de-Bellevue, Canada.